David Levithan's writing is magical. I've read other books of his before and am always amazed at the way that he weaves words together. There's something very lyrical about his writing, and very honest and real. A's narrative voice was often almost otherworldly -- so while A didn't necessarily sound like a 16-year-old, it made sense for a being which has no fixed body. A has lived in thousands of different lives, so it works that their voice is different than you would otherwise expect. The story is instalove, in respect to the fact that A sees Rhiannon and immediately knows that they love her, but I didn't have as hard of a time with it as I usually do. With A's otherworldly, not quite human sort of voice, and the fact that A has experienced thousands of lives and glimpses of relationships, so I had less of a hard time believing that they could instantly see Rhiannon and know that they want to be with her. The characters, by sheer virtue of the fact that A wakes up in a new body every day, are diverse. A finds themself temporarily inhabiting people of all genders, ethnicity, sexualities, religions, etc., and for the most part, A (and the writing) is not judgmental about the situations they find themself in. While it can come off a little after-school-story-ish (today we're learning about undocumented workers! today we're learning about being transgender! today we're learning about severe depression! ), overall, the situations and different lives are handled relatively sensitively and in an easy to understand way. I liked that we never get an answer as to why A changes bodies every day, or what they could do to stop it, or what would even happen if they did. If you're a reader who's frustrated by not knowing how everything works, or who likes a little explanation with their pseudo-science-fiction, this will probably frustrate you. If you're like me and can just go "okay, A switches into a new body every day for no real reason" and move on, then you'll be fine. So A is basically stalking Rhiannon, once they realize they looove her and don't want to be without her. A shows up at her school and engineers way to be around her before they finally decide to tell Rhiannon the truth. A comes off as well intentioned but Rhiannon is justifiably creeped the heck out by a) the impossibility of it all and b) the fact that A keeps showing up to be with her. When Rhiannon expresses some reservation about all of this, A turns into the "Nice Guy" who is all "woe is me, why doesn't she love me back, why have I been friendzoned!!" which got a little grating at times. A is so consumed by their instalove for Rhiannon that they basically abandon their ethical/moral code that's kept things running smoothly for 16 years of body switching. A starts making their host bodies skip school, miss family trips, go to parties, lie to their families, and otherwise engage in activities they may not usually do, just so that A can go spend time with Rhiannon. It's kind of hard to sympathize/root for A alll the time whenever they are putting their host's bodies and lives through all sorts of trouble. Like I said before, the book is pretty open and accepting of all the people that A inhabits, but there were a few exceptions that made me cringe. A temporarily inhabits a very obese teenager, and while A speaks with empathy for just about every other person they inhabit, A comes across as nothing more than grossed out this time, which made me uncomfortable. Also, the tone the book takes towards the subplot involving Nathan, one of the people whom A inhabits, was a bit frustrating/judging. Nathan and his family are probably on the slightly more extreme end of evangelical Christianity and are not portrayed in the best light. Without spoiling anything, comparing Nathan's subplot to A's makes A look very hypocritical at times, in a way that I don't think was really intentional. The ending was a little too deus-ex-machina for me, in that it wrapped the story up but didn't really satisfy much, or answer some of the questions I still had. It worked, but also hinges on the reader being okay with A kind of manipulating another person's life to get the results A wanted. There is talk of depression, self-harm, drug and alcohol use/abuse, and frank talk about sexual orientation and identity, although nothing of the above is ever really super graphic or inappropriate. 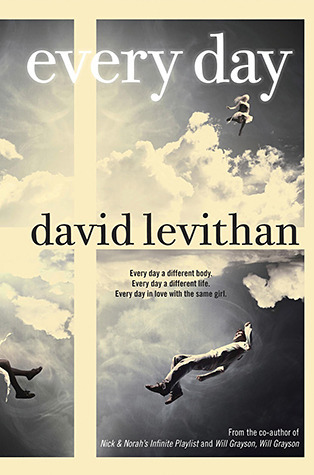 Even if you think this book may annoy you for the reasons it sort of bothered me, I would still recommend reading it on the strength of David Levithan's writing alone. It's an interesting take on a love story, and while problematic in places, is still probably worth a read. It was definitely very original! Even though there were some things about it that I thought were weird, the story and writing were so creative. A's love for Rhiannon definitely gave me pause-it was so all-consuming so fast and I felt really bad for the people's lives that were disrupted as he pursued her. Yeah, that was something that kept me from really loving the book as much as I wanted to. I guess the point is that people do crazy things for love, but it made me a little uncomfortable. I need to read this Sarah. But .... I am a little nervous- the two things you mentioned about obese people and Christianity- those tend to be deal breakers in books for me.... stink!